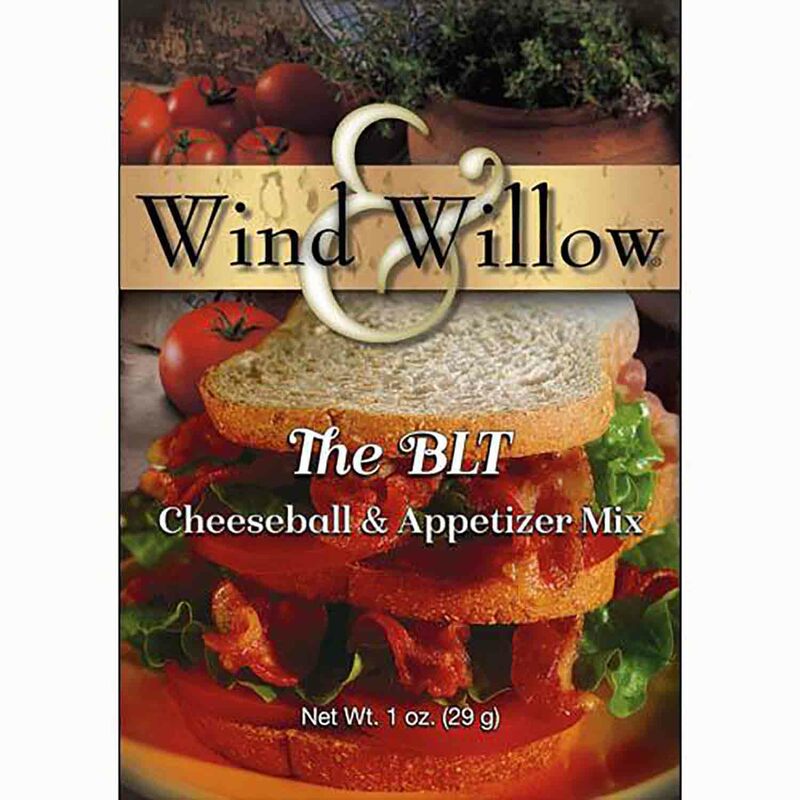 Brand: Wind & Willow WW-33103 Units: 1 mix From Wind and Willow company. Make up this beautifully packaged and delicious mix. Just add 8 oz. cream cheese and 4 tablespoons butter. Serve with a variety of crackers or vegetables or use as a filling for finger sandwiches. Fill cherry tomatoes and celery stalks or use as a spread on toasted French bread or Italian bread slices. From Wind and Willow company. Make up this beautifully packaged and delicious mix. Just add 8 oz. cream cheese and 4 tablespoons butter. Serve with a variety of crackers or vegetables or use as a filling for finger sandwiches. Fill cherry tomatoes and celery stalks or use as a spread on toasted French bread or Italian bread slices. Ingredients: Cheeseball: Imitation Bacon Bits [Textured Vegetable Protein (Soy Flour, Caramel Color, FD and C Red 3), Hydrolyzed Wheat Protein], Dehydrated Tomatoes, Hydrolyzed Corn and Soy Protein (Dried Yeast, Disodium Inosinate, Disodium Guanylate, Garlic Powder, Malic Acid), Salt, Dehydrated Onion, Spices, Natural Flavors (Modified Corn Starch, Corn Syrup Solids), Citric Acid, Maltodextrin, Torula Yeast, Autolyzed Yeast Extract, Dextrose, Soy Sauce Solids (Fermented Soybeans, Wheat, Salt), Lactic Acid, Sodium Citrate, Sugar, Silicon Dioxide, Calcium Silicate. Topping: Dehydrated Tomato, Parsley. Contains Soy and Wheat.